The Maldives is no stranger to the risks from climate change. It is already witnessing an increase in intense rainfall and resultant flooding, cyclonic winds and storm surges. As one of the lowest-lying countries in the world, with all its people living a few meters above sea level and over two thirds of its critical infrastructure lying within 100 meters of the shoreline, a sea level rise of just a few meters will put the nation further at risk, endangering its relative prosperity. Regional development is being complemented by large scale infrastructure development in the Greater Malé region. But, as in other small states, building resilient infrastructure in the Maldives is expensive. 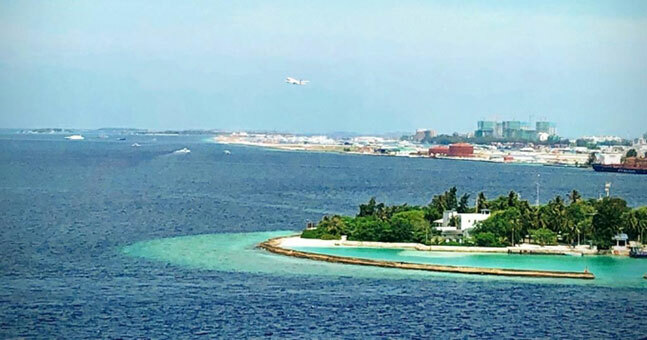 It is expected to cost the country around 35 percent of Gross Domestic Product (GDP) to ensure that the expanded international airport, the proposed network of bridges between Greater Malé’s islands, and relocation of the port are up to desired standards. To support the cost of constructing high resilience infrastructure, the country needs to be fiscally robust. Low fiscal strength significantly reduces a country’s ability to recover from disasters, provide its citizens with a safety net and prepare for future disasters. For the Maldives, protecting the tourism sector, which generates 33 percent of GDP, will be paramount. It’s safe to say that the Maldives is on many a bucket list – but that will stay the case only if those natural resources are protected and remain accessible. With higher standards of living – Maldives’ GDP increased from $268 in 1980 to more than $11,000 in 2017 – the scourge of waste is not far. While solid waste is a growing challenge worldwide, its management is particularly acute on small islands where it can’t be hidden – oftentimes from the very resorts that entice tourists to the Maldives in the first place. The resort islands that house well over 1 million guests annually and the growing number of guest houses have a flip-side – poor management of waste water and solid waste. This is the next frontier that the Maldives will need to tame. The Bank is working in partnership with the government to help address these issues; but the solutions largely lie in reducing the amount of waste, particularly plastic waste, as well as composting the high-volume household waste. A poignant lesson learnt for surviving on small islands is how well one can get citizens to own the problems and the solutions. People need to understand their exposure and vulnerability, and what they can do to help not only prevent the worst catastrophes but also build their own resilience to them. Together, the Bank and the government are looking at various options to help the Maldives plan better for eventualities, recover quicker and prevent a recurrence. But without citizen involvement these investments will amount to naught. Giving citizens a voice is critical to help any government manage climate risks.